Ouch! Having a seven year old can hurt sometimes. Point your finger at someone’s chest and ask “what’s that?” When they look down quickly pull your finger up and flick them on the nose. I did this on my 7-year-old recently for the first time. I don’t think he’d ever seen it before as he fell for it two or three times in a row as his sisters fell about in giggles. I had to try my best not to laugh too. 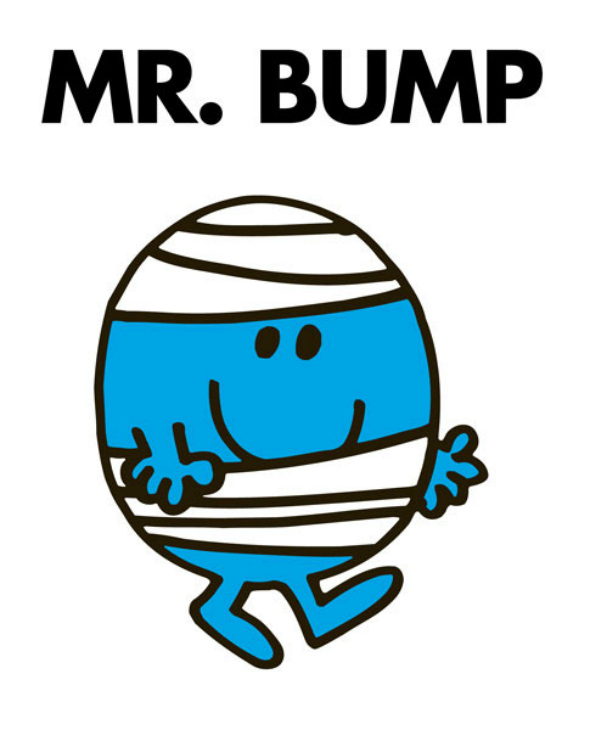 Mr Bump wasn’t accident-prone, he was just the parent of a small boy. “I don’t know.” I replied, genuinely confused as to why he wasn’t pointing at my chest. Before I’d barely finished the sentence, his hand raced towards my forehead, hitting me squarely hard on the forehead. Ouch! “It’s a world of pain!” he shouted joyfully, which I thought was brilliant, albeit painful. His sisters obviously agreed as they found it even funnier than my nose flicking.